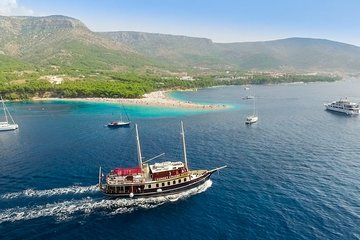 Conoce lo que hace que Golden Horn Beach sea tan popular en este crucero de día desde Split. Suba a bordo del barco y encuentre un lugar cómodo para relajarse en el camino a través de las Islas Adriáticas en el camino a Bol. Almuerce a bordo del bote y luego bájese en la playa de Golden Horn para explorar, relajarse y nadar. Navegue de regreso a Split mientras observa la puesta de sol sobre el océano. Wi-Fi y barra libre disponible a bordo. Snacks, almuerzo y barra libre a bordo del barco. This was our first excursion we did in Split. The service on the boat was wonderful and the crew were all very personable and welcoming. It was very easy to find the boat in the morning. The trip to Brac is relaxing. We sat in front upstairs in front of where the captain drives the boat. We had amazing views and could even see the dolphins that were hitchhiking. It was very nice of the crew to make sure that people were aware of this as it was a truly fun experience. We arrived to Brac on time and were able to disembark quickly for free time on the island. We had one goal in mind and that was to spend as much time as we possibly could at Zlatni Rat beach. It is about a 20 minute walk to the beach but it is quite a lovely walk and you pass several other beaches on the way there. We sure got lucky as Zlatni Rat beach was so crowded but we found two empty chairs and moved them to where there was an unused umbrella. It was 150 kuna for the chairs and umbrella. My advice, if someone is not using it, just claim it for yourself. There is someone who comes around who will collect money for the chairs and umbrellas. We had 4 hours on the beach and just enjoyed the water and scenery. It was truly beautiful. Definitely make sure to take a mask with you as there are lots of fish and other creatures to see under the water. We had to be back at the port by 4pm for boarding however there were two other large boats that were not leaving timely so we were delayed in boarding but were able to leave 5 minutes after our scheduled departure time. The cruise back was so peaceful. While they did serve your lunch in the afternoon in the dining room area we actually did not get any food as we were enjoying our seats upstairs and had plans for later to eat out in Split. People seemed overall very happy with the food. If you are looking for a relaxing journey and time to yourself to either explore the beach or the town of Bol on your own, I would definitely recommend this excursion. This is also a tour I would book again if and when I return to Split. I wish we could have stayed longer! Definitely recommend this tour. The crew on the boat were great and unlike a lot of other tours you are not packed in like sardines, there is plenty of room on the boat. The crew let us all know of dolphins on the way and the captain even did a 360 in the boat where they were so everyone could get a view of them. Meal wise this was one of the best meals I have had on a boat and I'm very fussy when it comes to food, I was expecting a buffet type meal but it was a proper sit down meal with salad, bread, main course and wine and even pudding made by a member of the crew! Arriving at Bol there is a long walk from the harbour to the beach but that's the only place the boat can dock but there are plenty of places to shop and drink on the way. A great day out with a great boat and crew.